Earlier Tuesday, President Nicolas Maduro called for an “economic counteroffensive” against the U.S.-led economic war ailing the nation. 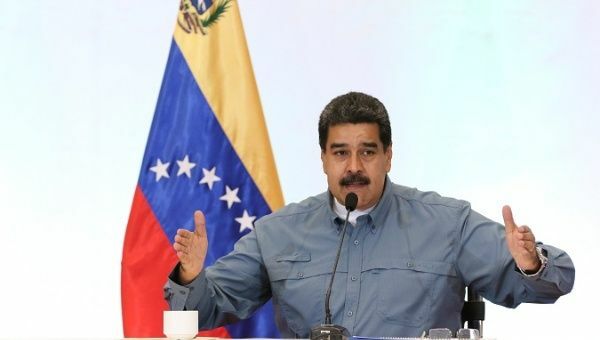 June 5 (teleSUR) Venezuela‘s President Nicolas Maduro has accused the United States of infiltrating high-level positions within the Venezuelan oil industry. “There was a process of penetration and infiltration in key positions of the petroleum industry, to control strategic information,” Maduro told a meeting of oil workers in the Petroleum of Venezuela (PDVSA) company on Tuesday. Earlier Tuesday, Maduro spoke at a national meeting of the United Socialist Party of Venezuela (PSUV) in Caracas, and called for an “economic counteroffensive” against the U.S.-led economic war that has seriously harmed the economy. “Now we will continue with an economic counteroffensive, the most difficult thing… we are going to win this battle for economic peace, for stability, for prosperity, and we are going to go the length in the fight against the criminal economy,” Maduro said. The Bolivarian government has been successfully battling corruption within the PDVSA and other important institutions. In February, three former directors of the state oil company were arrested for fraud.